“Sustainability is a nice, big umbrella, from energy efficiency and water conservation, to transportation, dining services, grounds, recharging stations, waste and recycling. It’s a little bit of everything, and it’s all about improving the student experience,” says Ms. Carrie-Lynn Black, Jacksonville University Sustainability Coordinator. She is busy preparing for a large-scale campus tree planting during the first week of June. “We’re planting some big live oaks, which is really exciting. Big, meaning that one fits on a semi trailer. They are 16 to 20-inch caliber trees, so we’re talking roughly 25 feet tall.” The concept behind site selection for the new trees, she says, is to maintain the beautifully-canopied main thoroughfare that stretches from Davis College of Business (DCOB) to Founders. The campus will receive two large trees per day for the first four days, to be placed outside Nelms, DCOB, Founders and other key locations. Eight species of trees, including adult live oaks, make up a total of 43 that roll in throughout the week of June 4. The first two big trees arrive on Tuesday bound for River House and the hill near Lot I on Dolphin Drive. “Jacksonville University is stepping up to do its part. As a result of your commitment to effective urban forest management, you are helping to provide a solution,” wrote Arbor Day Foundation Program Coordinator Lauren Weyers in a letter to the University earlier this year. In February 2018, Jacksonville University once again received its official 2017 Tree Campus USA recognition from the Arbor Day Foundation, now holding this distinction for three consecutive years, and well on the way to adding a fourth. Less than 350 college campuses across the nation have met Tree Campus USA requirements for this prestigious recognition. JU is among only 15 universities in Florida to bear the logo in recognition. Achieving Tree Campus USA’s five standards requires a serious commitment and includes (1) maintaining a tree advisory committee, (2) having a campus tree-care plan, (3) dedicating annual expenditures for those programs, (4) hosting annual Arbor Day observances on campus, and (5) promoting student service projects. These standards dovetail into JU’s overall Healthy Campus initiatives. The Arbor Day Foundation continues to support campuses, like JU and others across the country, in planting thousands of trees each year. In 2017, Tree Campus USA colleges and universities invested nearly $50 million in campus forest management and improvement, and JU continues its “greener and cleaner” commitment. For those who think that dedication to tree conservation and healthy campus environments is new to JU, the following throwback from 1971 should be of great interest. The Jacksonville Sesquicentennial Commission, Inc. was formed by local city government to plan an official observance of the city’s 150th year, from its founding in 1822. 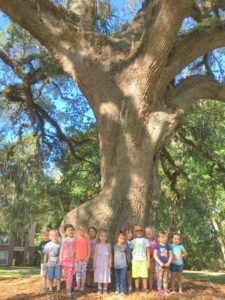 The “tree committee” of the Commission selected a specific oak located on the northern end of JU’s campus, and it was dubbed Jacksonville’s “Sesquicentennial Tree,” boasting more than 18 inches in diameter and approximately 60-feet high in the ’70s. In a letter dated November 3, 1971, and composed by University leadership at that time, the Sesquicentennial Tree was also documented by the City Agriculture Department and recorded as one among a wide variety of trees on campus, including magnolias, cedars, palms, sycamores, and holly trees. JU’s newly placed trees, all native to northeast Florida, will be added to its “tree inventory” or forestry database. “We launched this tool as a result of wanting a more formal method of tracking our tree canopy,” Ms. Black says. “It marks the exact locations of trees in the core of campus and provides a platform on which to document changes over time.” With back-to-back storm activity in 2016 and 2017, many changes were wrought across the campus landscape. 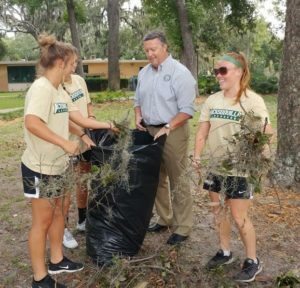 In a September 18, 2017 letter to the JU community, Jacksonville University President Tim Cost stated, “When this school – a home for all of us – is assaulted by high winds, lashing rain, a hurricane and a tornado, flooded buildings, torn roofs, downed trees, cancelled classes… all without a single injury or even a near-miss, then we stop and offer thanks.” Between Hurricanes Matthew and Irma, the number of trees lost totaled 40 out of countless trees covering the 240-acre campus–countless because the work of surveying the actual number is a very time intensive process, according to Ms. Black. JU’s response to Irma and all related damages upwards of $1 million manifested through a campaign called #StrongAsOak aimed at repairing and restoring both the naturescape and structures to its original beauty. Areas hardest hit included the Negaard Rowing Center, Milne Field, Historic Swisher Gym, Defender’s Den, and the Science Green, home to JU’s iconic and decades-old, outdoor commencement traditions. Our 32,000 square-foot LEED GOLD-certified Marine Science Research Institute has been leading the way since 2010 with solar photovoltaic panels, tankless hot water heaters, water bottle filling stations, and rain water harvesting for greywater use. JU Healthy Campus Initiative Launched in October 2016. Healthy Campus signage, 1300+ recycling bins, and hydration stations were installed before the start of Fall 2017, more than doubling the number of places students can fill reusable containers. JU became a smoke-free campus August 2017. J-Bike launched a first-ever and free bike-share program at JU in November 2017. JU became a foam-free campus in January 2018. JU completed its first greenhouse gas emissions inventory in April 2018. JU become the first private higher education institution in Florida to take the American College Health Association (ACHA) “Healthy Campus Pledge” and is now an official Healthy Campus 2020 Partner. 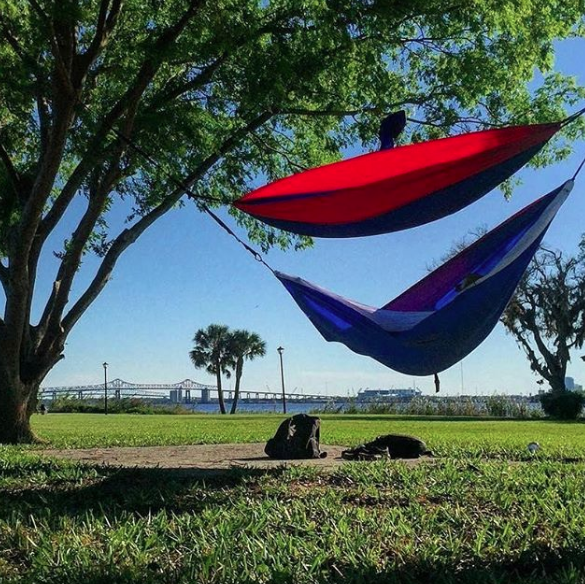 Students at JU, whether commuters or residents, are emotionally invested in the natural beauty and health of their unique riverfront campus. 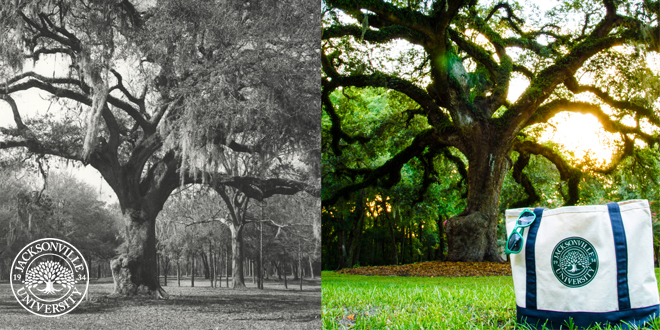 From Arbor Day tree selfies to hammock hanging year-round to on-campus weddings, the trees of JU are front and center, and will forever remain at the heart of the University.